Giant Sun's Surface Imaged for the First Time Ever! 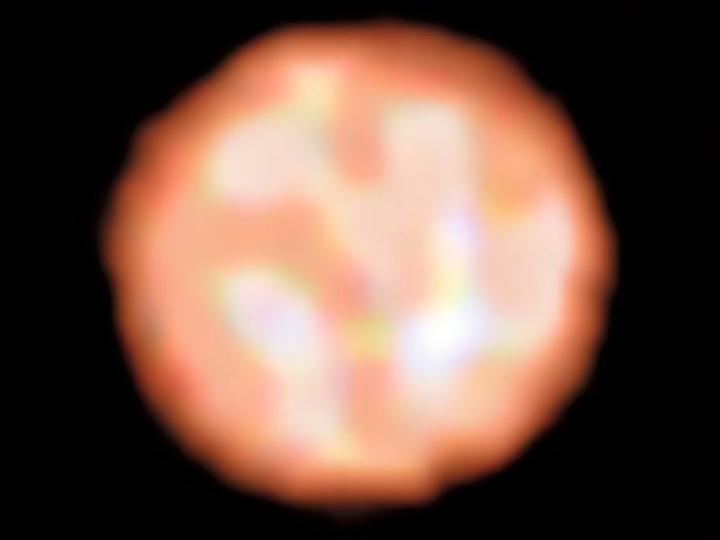 Check out this first-ever image of the surface of a giant star outside our solar system! "This is the first time that we have such a giant star that is unambiguously imaged with that level of details," said Fabien Baron, assistant professor of physics and astronomy at Georgia State University. "The reason is there's a limit to the details we can see based on the size of the telescope used for the observations. An international team of astronomers has produced the first detailed images of the surface of a giant star, named π1Gruis, outside our solar system, revealing a nearly circular, dust-free atmosphere with complex areas of moving material, known as convection cells or granules, according to a recent study.